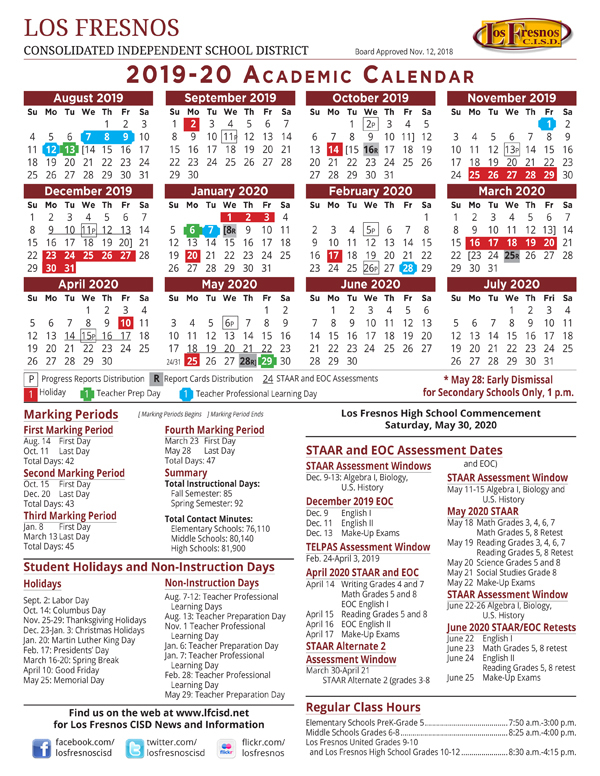 Los Fresnos CISD Board of Trustees approved the 2019-20 Academic Calendar at its regular monthly meeting Monday. The calendar marks the fourth straight year that Los Fresnos CISD will take advantage of opportunities provided by the district’s adoption of District of Innovation status. The 2019-20 calendar shows a few differences from the current 2018-19 calendar. Start of first marking period: Aug. 14; End of first marking period: Oct. 11 (42 days); Start of second marking period: Oct. 15; End of second marking period: Dec. 20 (43 days); Total class days first two marking periods (first semester): 85 days; Start of third marking period: Jan. 8; End of third marking period: March 13 (45 days); Start of fourth marking period: March 23; End of fourth marking period: May 28 (47 days). Other important dates on the calendar include: Columbus Day holiday: Oct. 14; Thanksgiving holidays: Nov. 25-29; Christmas holidays for students: Dec. 23-Jan. 7; Professional learning day/no classes for students: Feb. 28; Spring Break: March 16-20; Good Friday: April 10; Memorial Day: May 25. Semesters that can be more balanced. There are 85 class days in the fall and 92 in the spring, which helps a more even delivery instruction at the high school level – particularly core subjects that are a single semester in length. Finishing the semester in December allows mid-term graduates to begin the spring semester at colleges of their choice at the same time as other college students. Finishing the school year in May allows graduates to begin summer classes at the colleges of their choice on time. An earlier ending date allows students needing summer remediation more time to prepare for the administration of the STAAR/EOC retests in June.